I was in a meeting with a client when it came. The email. Subject: Re: Lunch with Madame Christine Lagarde (IMF Managing Director). My eyes widened as I thought ‘no way!’ I immediately showed it to my client who was incredulous as well. Actually, he said something but I can’t even remember. I thought aloud ‘Oh my God what will I wear? !’ and this got him laughing. ‘See women’ he said. If this had been another day, I would probably have started a fight but trust me this was not a day to fight for women’s right. As soon as I had the time, I visited Google to find out as much as I could about this wonderful lunch date of mine. So this is how I found myself at the IMF (International Monetary Fund) Future of Work in Africa Conference at the Movenpick Ambassador Hotel in Accra on Monday 17th December, 2018. Participants to the lunch had been invited to the conference too so I even went along with Reaga Right, my Creative Director. First spoke Prof. Djan Baffour who had been my boss’ boss’ boss during my days as a National Service Person at the Ministry of Finance and Economic Planning. And then our very articulate Vice President H.E. Dr. Bawumia spoke as well. I remember thinking ‘interesting, I have met both H.E. Hajia Samira Bawumia and then her husband this year’ smiling to myself as if I had just won an award! 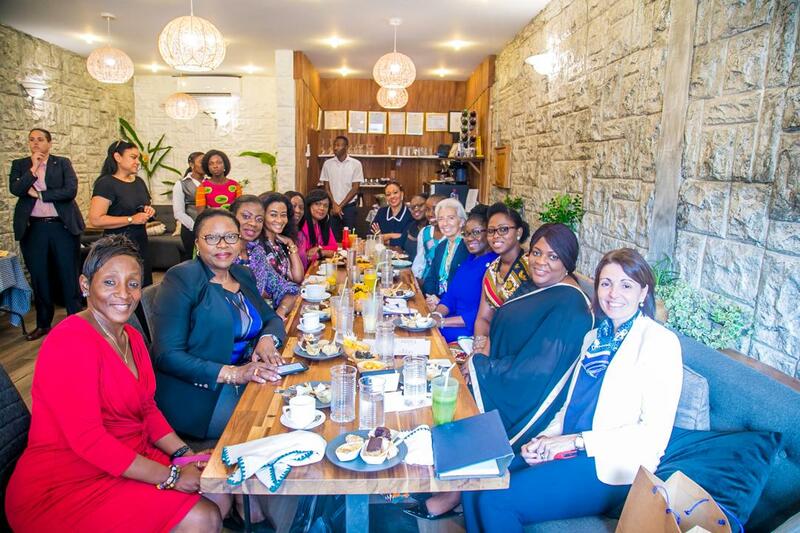 Inspired by the fantastic discussion I had with women leaders in Ghana, making strides in different areas like telecom, finance, and cocoa! And then Ms. Lagarde took to the stage. OK so before I go any further, let me confess that I usually worry before attending such conferences where important words like ‘economy’ and ‘policy’ are used, because like I said; important words are used and they tend to be quite big and unfathomable for a girl who ran away from Economics after her first degree! However, I was actually surprised to find out that she spoke a version of English that I could really understand and relate to. She even used an African Proverb in her speech ‘the eye crosses the river before the body’ Impressive! I thought. Soon it was 12.00noon and I had to excuse myself to make it in time for the lunch at the Sunshine Salad Bar in Osu. 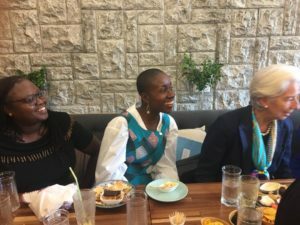 When I got there, I met two ladies; Ms. Joyce Ababio whom I had heard of and respected since I was a child, and Ms. Angela Kyerematen-Jimoh, CEO of IBM Ghana. Of course, I instantly felt humbled! I was in great company. We got chatting right away about general issues and then who walked in? Ms. Mansa Nettey, CEO of Standard Chartered Bank! Things were getting hot! Soon Ms. Lagarde and the rest of the ladies joined us. At first I pulled a seat away from her and then thought ‘chic! Sit close where you can hear and learn more!’ And so I did, right next to her. It is interesting, I have been among less ‘intimidating’ (for want of a better word) company and felt super nervous. Yet here I was in the presence of such power houses as the IMF Managing Director, Electoral Commission Boss among others but felt really at home. It was surreal actually. I ordered a second glass of the Mango Lassi (seriously, it was that good!) as I listened to the chatter around the table. I thought ‘wow, this is such a high level table and yet I can actually understand the conversation!’ Everybody was just so relaxed and chatting as if we have been doing this forever! And Ms. Lagarde asked us to introduce ourselves and this part was just so beautiful; listening to woman after woman tell us all a bit about her story. Haha even writing this has brought a warm feeling in my heart. I noted the names of each of the women at the table as I made a mental note to reach out to each of them later. Side note: the content of the conversations here and at the conference were very beneficial to me but I have chosen to talk about how I felt as well as a key lesson for me in this experience. Oh and by the way, remember how I fretted about what to wear for the conference? Well, guess who was asked if I was wearing Christie Brown?! And guess whose photo was taken by another lady so my dress could be shown to someone else! Haha that just sealed the deal for me that day. Yes I felt really good! My dress was actually made by Veiling Creations in Kumasi. 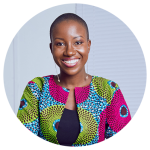 I did not want to miss the last panel discussion for all the jollof Packs & Trays can make! First, Ethel Cofie was speaking and I was super proud! And guess who the moderator was, Ms. Lagarde herself! The icing on the cake for me was that one of the panellists was Ms. Michaella Rugwizangoga, CEO of VW Mobility Solutions in Rwanda. Her appointment simply wowed me and I had been fantasizing about an interview with her for The Fabulous Woman Network. The very calm and collected Hon. Ken Ofori-Atta, our Minister for Finance as well as an entrepreneur called Ms. Rebecca Enochong from Cameroon were panellists too. OK now to the point; it was something I heard about the IMF boss here which shot my respect for her through the roof and straight into space! What!? Did I just hear someone say Ms. Lagarde went into a meeting with a list of women who could potentially fill a certain high level role? And that when someone said ‘oh but we do not know women who can do the job!’ she pulled the list out of her pocket? My goodness! This was when I realised that this woman really truly cared about bringing more women to the table. I mean I know we talk a lot about empowering women and all, but this action right there was not talk; it was action. An intentional one made by a woman at the very top who genuinely wanted to see other women rise. Can I pause and give her a standing ovation? As I ponder over this single act of hers, I cannot help but start looking into my own actions. Have there been times when I could have vouched for another woman but did not? I do realize that I cannot go back in time to right certain wrongs, but going forward I am going to be intentional about paving the way for other women whenever I get the opportunity. It has been a week since I had this experience. I have said my thank yous, reached out to all the new contacts I made and kindly requested to interview the 13 other women present (I have already had the privilege of sharing Mabel Simpson’s story). It was one particular response to my interview request from one of these top Ghanaian leaders which actually inspired me to write about my Christine Lagarde experience. She gave me an assignment which excites me! You know, before this experience I had been a bit wary (as usual haha). I had been wasting my time worrying about all that I really want to do in 2019 and wondering how they will all pan out. But suddenly, I feel 2019 is going to be an extraordinary year and that I should not worry! Who knew I would be invited to lunch by the IMF Director at the end of 2018? Oh and guess what, the year has not even ended yet! I am excited, are you?